Aramark delivers experiences that enrich and nourish people’s lives through innovative services in food, facilities management, and uniforms, wherever people work, learn, recover and play. We provide award-winning services to hospitals, universities, schools, stadiums, businesses, municipalities and many other clients. Aramark operates the food and beverage as well as housekeeping departments on gameday. Opportunities include but are not limited to creating signature stadium fare in newly renovated concession stands, serving guests in luxury suites and all-inclusive private clubs, and creating a clean and safe environment for our guests. 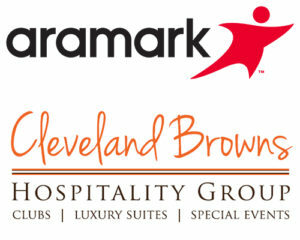 Click here for more information on Aramark & Cleveland Browns Hospitality Group. Click here for job opportunities with Aramark. Our mission is to bring people together for the excitement of Cleveland Browns football and enhance their experience by providing the best quality service in a clean, safe environment. The Cleveland Browns Guest Services staff operates the information kiosks around the stadium as well as the premium areas, including the suites and clubs. Our gameday team members play a pivotal role in creating the best possible experience for our guests, from the moment they enter the stadium until the moment they depart. Click here for more information on the Cleveland Browns. Click here for job opportunities with Cleveland Browns Guest Services. CSC operates as the gameday security staff at FirstEnergy Stadium. Our positions include gate and field security as well as various usher and greeter staff throughout the stadium. Click here for more information on CSC. Click here for job opportunities with CSC. At Legends we are committed to delivering INNOVATIVE services for PREMIER partners to create LEGENDARY experiences. Legends operates 12 retail locations throughout FirstEnergy Stadium, including the main Pro Shop which is open daily to the public. In addition, we operate outside events such as Training Camp, Orange and Brown Scrimmage, Draft Night and other Browns operated events. During all events we focus on bringing a legendary shopping experience to all fans, by delivering the best merchandise and customer service. Click here for more information on Legends. Click here for job opportunities with Legends.